(Gilbert, AZ) – Wednesday, Former Arkansas Governor and Republican Presidential candidate, Mike Huckabee, endorsed his good friend and conservative business leader, Christine Jones, in the race for Arizona’s Fifth Congressional District. The endorsement comes as East Valley citizens cast their early ballots. Governor Huckabee’s endorsement was released along with a video message in which he spoke amiably of his friend Christine Jones. In his message, Governor Huckabee points out that the elitist forces of Washington are scared to death of Christine Jones because she can’t be bought. “She’s my friend. She’s someone I know, someone I trust…” and, “I believe that when you send her to Washington, you’ll know, you have someone who’s fighting for you, not someone fighting just to keep the special interests and the status quo alive and well,” the Governor remarked in a personal statement. 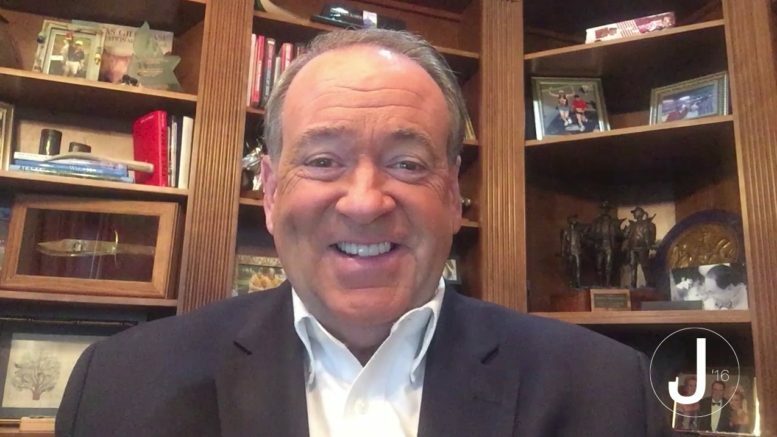 View Governor Huckabee’s video endorsement HERE. Christine Jones is the former interim CEO of Great Hearts Academies. She was a Republican candidate for Governor of Arizona in 2014 and Executive Vice President, General Counsel, and Corporate Secretary for Go Daddy Operating Company, LLC from 2002-2012. Christine and her husband, a retired Air Force officer, have been married for 29 years. He teaches in the Chandler Unified School District. Be the first to comment on "Governor Mike Huckabee Endorses Christine Jones in CD-5 GOP Primary"